People who have migrated to a country or been born in a country as an alien, and who stay, are usually able to acquire the country's nationality by naturalization. Naturalization generally results in them acquiring the same (if not a similar) civil status as people who acquired the country's nationality through birth whether overseas or in the country. In primarily jus soli (right of blood) states, the problem arises as to whether a child born in the state's territory, to alien parents who are not legally residing in the state, should acquire the state's nationality. In other words, should the child of illegal aliens, or of transient (non-resident, unsettled) aliens, have access to nationality by birth? In primarily jus sanguinis (right of blood) states, the problem arises as to whether the descendants born in the country to "first generation" alien parents should be allowed to acquire nationality if their parents, or if they themselves, have met certain residency conditions. An increasing number of such states are making such provisions in order to incorporate "second generation" aliens into their nation as early as possible -- partly in recognition that such aliens were born and raised in the country to settled aliens, and partly to minimize the emergence in the country of what I would call a "native alien" population. In this article, I will explore mainly the positive measures that various countries have taken to attribute their nationality to children born to aliens in the country. For a look at the vulnerability of such measures to abuse and fraud, see Nationality law abuse and fraud: Exploitation of blood and soil "birthright" principles. The term "alien" is used to mean someone who is not a "national" of a country, which means that the person does not possess the person's nationality. Aliens and nationals may also be natives or non-natives in terms of whether they were born in their country of nationality or residence. And generations of descent may be counted from any parent. I will first talk about "generations" and then "nativity" in reference to aliens and nationals alike. I will then link these concepts with the provisions that various countries make in their laws for nationality acquisition by "native aliens" and also by the offspring of "non-native nationals". All of the "examples" in this section are fictitious. In order to facilitate the discussion of issues related to the acquisition of nationality by children of aliens, it is useful to define "generations" of alien status. The following definitions stress the point in time from which a person's legal status as an alien in a country began -- not the person's familial generation based on migration to the territory. In this article, I am calling anyone who is born abroad and migrants to a country as an alien, or who becomes an alien by losing a country's nationality while in the country, "first generation". Example 1 A national of the People's Republic of China who migrants to Japan or to the United States -- regardless of their legal status while in the country -- would be "first generation". Example 2 A national of Japan who loses Japan's nationality while in Japan would be "first generation". The largest category of such people are those whose family register was in Taiwan or Chosen and who were residing in Japan on 28 April 1952, when they lost their nationality on account of Japan's abandonment of Taiwan and Chosen under terms of the San Francisco Peace Treaty and related legal actions that came into effect on that date or later. Note that that vast majority of first-generation aliens in Example 2 were not migrants to Japan. Most had migrated from Taiwan or Chosen to the prefectures as Japanese when Taiwan and Chosen were parts of Japan. Many others were born in the prefectures, again as Japanese. After World War II, during the time that Japan became "Japan" under Allied Occupation Authorities, Taiwanese and Chosenese remained in the prefectures as Japanese -- though under Allied policies and related Japanese government measures they were treated as "non-Japanese" for a number of legal purposes. Their status as "first generation aliens" derives entirely from their change of legal status on 28 April 1952 -- irrespective of their family history, which may count generations from the generation that migrated to the prefectures. In this article, I am calling "second generation" anyone who is born in a country to a "first generation" alien parent. Example 1 A child born in Japan or in the United States to a woman who is a national of the Republic of Korea, who migrated to the country as an alien, whether she is in the country legally or illegally. Example 2 A child born in Japan to an alien woman who became an alien by losing her Japanese nationality while in Japan. There are, of course, third and subsequent generations of aliens in right-of-blood states that do not yet have provisions for second-generation nationality. Higher generation aliens become increasing less probable, though, as native aliens are likely to marry nationals, and the children of such unions are likely to become nationals (if not dual nationals). Second-generation nationality provisions may apply only to minors or extend also to adults. As the aim of such provisions would be to alleviate the occurrence of third and subsequent generation aliens, they may also include special transitional or retroactive measures for existing aliens of third and later generations. Generational distinctions can, of course, be made among nationals. The kind of distinction I am making here, between alien parents and their offspring, would also facilitate an understanding the problems that child born abroad to a national of Japan or of the United States might have in acquiring Japanese or US nationality. The nationality problems of children born to national parents are not essentially different from those of children born to alien parents. Both cases involve conflicts and compromises between jus soli and jus sanguinis principles, and otherwise expose the limitations and commonalities of such principles (see "Convergence of principles" below). If "generation" of alienage or nationality is a measure of "when" someone became an alien or a national, then "nativity" signifies the relationship between one's place of birth and alien or national status. Here I am using "native" to refer to the situation of having been "born" somewhere. A person who is born an alien in a country is a "native" of the country while a national of a country who was born outside the country is not a native. A person who is born in a country as a national of the country, and later becomes an alien, is also a "native" of the country. While a person who became a national of a country, through birth outside the country, is not literally a "native" of the country. Nationality laws generally do not make such terminological distinctions, but some make equivalent distinctions by providing different nationality acquisition rules at time of birth or later in life depending on whether a person was born in the country or abroad. In this article, I am calling anyone who was born in a country, and is presently an alien in the country, a "native alien". The term naturally includes second, third, and subsequent generations of aliens. However, some first-generation aliens in a country may also be natives of the country. Example 1 A child born in the United States to alien parents who are in the United States in a diplomatic capacity is a "native alien" as well as a "first generation alien". Example 2 All three members of a Taiwanese family living residing in Matsuyama became "first generation aliens" in 1952 as a result of losing their Japanese nationality. The daughter, born in 1948 in Matsuyama into a Taiwan register, and the mother, born in 1923 in Miyazaki into an Interior register, are "native aliens". The father, born in 1918 in Taihoku into a Taiwan register, is a "non-native alien". The father and mother were both Japanese when they married. When they married, she migrated from her Interior register to his Taiwan and therefore became Taiwanese. They were still Japanese when their daughter was born, and so their daughter became Japanese through birth. Example 3 In 1970, the daughter in Example 2 had a son by a Japanese man to whom she was not married. He failed to recognize the child before its birth. The child acquired Republic of China nationality under ROC's then matrilineal provision for unmarried national women. The child is a "second-generation alien" with ROC nationality. I have a book called Native American Aliens by Donald E. Collins (Westport, Connecticut: Greenwood Press, 1985, Contributions in Legal Studies, Number 32). It is properly shelved in the Japanese American section of my library -- for, as its subtitle states, it is about "Disloyalty and the Renunciation of Citizenship by Japanese Americans during World War II. The book is about 5,589 people -- "one in every fourteen American citizens of Japanese descent" -- who "gave up their citizenship in the land of their birth" during a three-month period in 1944-1945 (page 3). Collins contends that "few of those who renounced their citizenship were truly disloyal to their country; rather, they were reacting to real and imagined events which were often beyond their control." Collins intends the title of his book to apply to persons who have lost or renounced a nationality while in the country of the nationality. But the term also applies to people who are born in a country without acquiring its nationality. The Legal and American Indian sections of my library includes books about Native Americans who were born aliens -- before the Indian Citizenship Act of 1924, which declared that "all non citizen Indians born within the territorial limits of the United States be, and they are hereby, declared to be citizens of the United States". Before this act, "untaxed Indians" -- who were not considered fully "subject to the jurisdiction" of the United States -- did not become US citizens at birth. Until this act, such Indians became citizens only by forfeiting their rights as members of Federally recognized tribes. Even today, persons born in the United States, who are not subject to the full jurisdiction of US laws, do not become citizens. The term "Native American aliens" thus includes, for example, children born in the United States to alien parents who have diplomatic imunity. Example 1 The same woman in Example 3 above married the Japanese father of her son in 1971. The boy could not become Japanese because Japan's 1950 Nationality Law does not yet have a provision for recognition and legitimation after birth. The couple were in New York in 1974 when she gave birth to another boy. The father registered the boy as his son and reserved the boy's nationality under Japan's then patrilineal nationality law. The boy appears on his father's family register as his "first son" though in fact the boy is his second son. Under US nationality law, the boy is also eligible to claim US citizenship. He is not a ROC national because ROC's law is then patrilineal for nationals in wedlock. The boy is both a "first-generation non-native Japanese" and a "native American". Example 2 An American couple residing in Tokyo give birth to a daughter in 1953. They register their son's birth at the US Embassy and obtain a US passport for him. He is both a "first-generation alien" and a "native alien" relative to Japan and a "first-generation non-native national" relative to the United States. Example 3 The son in Example 2 spends a couple of summer's in the United States but never resides there. In 1976 he marries a Japanese woman and they have a daughter. The daughter is ineligible for US nationality because her American father does not meet minimum residency requirements in force at the time. And she cannot acquire Japanese nationality because Japan's law is then patrilineal for nationals married to aliens and has no provision to prevent statelessness. So she becomes stateless. Relative to Japan she is a "second-generation alien". Relative to the United States she fails to become a "second-generation non-native American". An important difference arises between countries as to whether their nationality laws -- regardless of which principle of nationality they adopt as their primary standard -- make specific provisions for nationality acquisition by children born in the country to alien parents in the country. It is no longer a matter of a state being primarily either jus sanguinis (right of blood) or jus soli (right of soil) -- for both kinds of states are now apt to mix the two standards in order to differentiate between children born to settled aliens and children born to short-term visitors. Most people come by their nationality passively through birth to parents who are living in their country of nationality. That the country may be jus sanguinis or jus soli really doesn't matter for such children. The difference between jus sanguinis and jus soli matter only for children born in a country to aliens, or for children born outside a country to nationals. Countries with jus soli laws generally make jus sanguinis provisions for children born outside the country to nationals, but such provisions might include residency requirements for the parents. In other words, the jus soli state will place jus soli restrictions on a jus sanguinis principle. While jus sanguinis states in principle provide that children born abroad to nationals acquire nationality, they too may impose residency requirements on the national parents. This, too, amounts to placing jus soli restrictions on a jus sanguinis principle. Jus soli and jus sanguinis states are motivated to place residency restrictions on second or third generation acquisition abroad, in order to minimize the population of nationals who grow up having virtually no social experience in the country, and possibly no immediately family ties. Such people are likely to have another nationality, most probably that of the foreign state where they were born and raised. States that adopted jus soli principles generally coveted population, or at least they considered themselves open to alien migrants who would settle in the country. It made sense, to them, for the children of such migrants to acquire nationality through birth. Such generally made provisions for settled aliens to naturalize. In the past, some states, like United States, placed racist "national origin" restrictions on naturalization. States that adopted jus sanguinis principles either did not welcome more people, or did not view themselves as places that would attract alien settlers. It made sense, to them, to base nationality at birth on family ties with national parents. Such states, including Japan, made provisions for settled alien parents and their children to naturalize. It was generally possible for minor children to be naturalized along with their parents. Naturalization provisions were generally relaxed for aliens born in the country. Today, though, some jus soli states -- which constitute the minority of states -- are encountering various kinds of limitations on their readiness to accommodate unconditional numbers of new comers, whether as migrant aliens, or as children born to unsettled aliens. Such states are especially concerned with the increase in traffic of aliens who come only to give birth to a child, who then acquires the state's nationality -- and through nationality rights of abode and other rights, which may extend to its parents. And not a few jus sanguinis states -- which constitute the majority of states -- have found themselves more attractive to aliens who come to stay, and have children, who then grow up without the state's nationality. And, unless they naturalize, their children, too, will be born without the state's nationality. The state then has a growing population of aliens who are essentially like nationals born and raised in the country -- but, lacking its nationality, are unable to be treated like nationals. Jus soli and jus sanguinis states solve their somewhat different problems similarly -- by imposing residency requirements on alien parents or their offspring. In effect, though, their primary jus soli and jus sanguinis principles converge toward a similar mix of principles. Apart from the general differences in the origin and nature of the "second generation" nationality problem in jus soli and jus sanguinis states, the solutions are similar. Jus soli states are motivated to condition their place-of-birth principle by nationality. Children born in the country to a national become nationals at birth. Presumably this would include cases in which both parents were nationals as well as those in which only one of the parents was a national. The law would become essentially jus sanguinis, since it would be based on parental ties. Children born to alien parents, or to an alien parent having no relationship with a national, would be treated differently according to the status of their parents or parent. There are many possibilities. The state could allow a child born in the country to alien parents (including the case of a single alien parent having no relationship with a national) to acquire its nationality at birth if its parents meet certain alien status and/or residency conditions that qualify the parents as "settled aliens". In other words, "settled aliens" would be regarded as "quasi nationals" for purposes of jus soli acquisition of nationality by their children. The state could deny its nationality to a child born in the country to an unsettled alien -- but then differentiate between different kinds of non-settled alien parents. Children of non-transit alien parents might be allowed acquire the state's nationality by operation of the law -- rather than through naturalization -- at some point in the future, before or after the child becomes an adult. Such provisions might also be conditioned by changes in the parents' status. Children born in the country to transit alien parents could be denied any form of facilitated nationality. As children of transit aliens, they would be expected to leave the country with their parents -- and the fact that they were born in the country would not be advantageous in future applications for any non-transit status. Jus sanguinis states already provide that children of nationals -- including those fathered by an alien man with a national woman whether or not they are married, and those fathered by a national man with an alien woman, and recognized by the man -- though legitimacy may also be required. All they need to do is define conditions under which they might treat some alien parents as "quasi nationals" for nationality purposes. The nationality options jus sanguinis states could offer children born in the country to alien parents are essentially the same as those available to jus soli states. They, too, could rank alien parents according to their alien status, and define any number of conditions their children to acquire the state's nationality at-birth or later in life. In these ways, both jus sanguinis and jus soli countries are rounding off the harder edges off their primary nationality principles. That both kinds of states might share similar concerns about social or familial connectivity should not be surprising -- since all countries essentially value "attachment" with their political societies. Residency restrictions are, in fact, all about attachment. In many ways, attachment trumps both birth "in the country" and birth "to a national of the country" as a criterion for acquiring its nationality. More important than where one was born, or to whom one was born, is where one has lived. In short -- countries are increasing preferring to attribute their nationality -- and extend a full set of their elements of citizenship -- to people who breathe their air, drink their water, eat their food, speak their language, attend their schools, and stay -- for at least some period of time. All nationality laws can be exploited. Some parents contrive a child's birth to take advantage of a provision of the law that was not intended to provide nationality to such a child -- e.g., a mother intentionally travels to a jus soli country merely to qualify her child as its national. Other parents take of advantage of circumstances they did not plan, but which amount to the same conditions that qualify their child as a national -- e.g., a mother is traveling in a jus soli country when her child is born earlier than expected. Neither of the above cases would constitute fraud. But such cases, and others, could involve illegal acts, including misrepresentation of facts or false claims on documents. See Nationality law abuse and fraud: Exploitation of blood and soil "birthright" principles for more about how some countries, including Japan and the United States, are attempting to minimize exploitation of their nationality laws. Japan's Nationality Law has no provisions for attributing its nationality the Japan-born children of aliens who are permanent residents or fulfill other residency requirements -- whether at the time of the child's birth or later in life. Consequently, in Japan, a number of aliens are 2nd if not 3rd generation aliens. Many if not most aliens in Japan of all nationalities marry Japanese. Since 1985, when the Nationality Law became ambilineal, most children of such unions have become Japanese through the Japanese parent. Children born in Japan to alien parents become Japanese only if neither parent has a nationality -- i.e., only if both parents are de jure stateless. Alien demographics in Japan today would be considerably different had Japan adopted provisions for 2nd-generation nationality for the Japan born children of permanent residents. About half of the roughly 2 million aliens residing in Japan as of the end of 2013 were general permanent residents (31.71%) or Special Permanent Residents (18.06%). About one-third (36.29%) of the permanent residents were Special Permanent Residents (SPRs), while roughly two-thirds (63.71%) were general permanent residents (GPRs). The breakdowns by country and region for SPRs, and by country for GPRs, are as follows (My compilation, and my percent computations, of tallies as of end 2013, as reported in the 2014 edition of an annual report on alien residents. The SPR population is complex in terms of generations, as the definition of "generation" varies from period to period. I would guess that as many as 70 or 80 percent of the SPR cohort was born in Japan. Perhaps one-fourth or one-third of the GPR cohort was born in Japan. The Republic of China does not to my knowledge make provisions for 2nd-generation nationality. In principle, people born as aliens in ROC are required to naturalize. The People's Republic of China (PRC) appears to have no provisions for attributing its nationality to PRC-born children of aliens who meet certain residence conditions, either later in life or at time of birth. PRC, as a right-of-blood state, recognizes children born in China as Chinese if at least one of its parents is a PRC national -- or, strictly speaking, a person who possesses PRC nationality, since PRC does not use the term "national" (国民) to refer its "people" (人民). PRC applies the same ambilineal jus sanguinis principle to the children born overseas to Chinese who overseas at the time of the child's birth. However, PRC does not attribute its nationality to such a child if (1) its parents is a Chinese who has settled in the foreign state, and (2) the child has acquired the foreign state's nationality at birth. So, under PRC law, a child born in the United States to a PRC parent who had settled in America would not be recognized as Chinese. China attributes its nationality to children born in China to alien parents, if the parents (1) are stateless or of uncertain nationality, and (2) have settled in China shall. The Republic of Korea does not to my knowledge make provisions for 2nd-generation nationality. In principle, people born as aliens in ROK are required to naturalize. France's birthright nationality provisions mix jus sanguinis and jus soli criteria in somewhat unusual ways. France's nationality law is primarily jus sanguinis, in that any child, born anywhere in the world, can acquire French nationality if either of its parents is French. A child born in France, or in any of its territories, acquires French nationality at time of birth if either of its parents was also born in France. This "double jus soli" criterion has the effect of withholding French nationality at time of birth from the French-born children of 1st-generation (immigrant) alien parents. If both alien parents are stateless, then the child becomes French -- just as a child born in Japan to de jure stateless parents would become Japanese. Unlike Japan, France attributes also attributes its nationality to a child born in France to alien parents who have nationalities which the child is unable to acquire. However, alien children born in France can acquire what I would call "later-in-life birthright nationality" as early as age 13 upon request by the parents, and as early as age 16 upon request by the child, depending on the parents' or the child's residential situation. There are also a number of legacy provisions for children born in France to parents born in a colony or territory under French sovereignty before it became independent. The most general provision is that those born in France before 1 January 1994 are regarded as French from birth, while those born on or after 1 January 1994 can become French at age 18. In other words, 1 January 1994 marks the start of a stricter policy toward the attribution of French nationality to the children of former colonial or territorial subjects. German nationality is generally right of blood, meaning that at least one parent must be German. However, children born in Germany on or after 1 January 2000 to alien parents may acquire German nationality if at least if at least one alien parent (1) has been a permanent resident for ate least 3 years, or (2) has been residing in Germany for at least 8 years. Germany has nationality retention provisions like Japan. Or -- to put it more accurately -- Japan's provisions for nationality choice, introduced in revisions effective from 1985, were modeled on amendments Germany had made in its law in 1963. Dual national German children have been required to apply for retention of their German nationality (confirmation of intention to remain Germans) before their 23rd birthday. The age of majority in Germany is 21. In Japan it is 20. Hence Japanese dual nationals who wish to retain their Japanese nationality are supposed to file a "Nationality Selection Notification" by their 22nd birthday. However, unlike Japan, Germany does not require natural German dual nationals -- i.e., those who have acquired both their German and foreign nationalities at time of birth -- to apply for retention of their German nationality. While Germany does not positively recognize dual nationality, it generally doesn't not object to naturally acquired multiple nationality. The United States has long been a target of alien women or parents who contrive to be in the United States when their child is born, in order to establish secure a "nationality of convenience" for their child and a "foothold" for themselves as the mother or parents of an American citizen. The following book gives advise on how to give birth in Hawaii. Let's give birth in Hawaii! Hawai de genki ni akachan o umoō! [Healthily give birth to a baby in Hawaii! 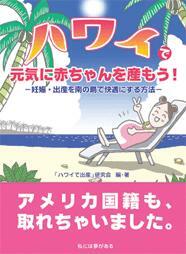 This is not the sort of book a pregnant woman -- flashing a smile, "V" sign, and Japanese passport -- wants to show a U.S. Border Control official at a port of enter. A lot of questions will be asked, and entry could be denied the woman if it appears she had ulterior motives for visiting the United States shortly before she is due to give birth. A number of bills have been proposed in the House of Representatives to stem the tide of "anchor babies" which ease the immigration restrictions otherwise applicable to their alien mothers or parents. None of the bills have passed. The most recent such bill was H.R. 1868, the Birthright Citizenship Act of 2009 (111th Congress, 1st Session, 2 April 2009). The purpose of H.R. 1868 was "To amend section 301 of the Immigration and Nationality Act to clarify those classes of individuals born in the United States who are nationals and citizens of the United States at birth." The substance of the bill -- which was very short -- was as follows. (b) Applicability -- The amendment made by subsection (a)(3) shall not be construed to affect the citizenship or nationality status of any person born before the date of the enactment of this Act. The bill would have made children born in the United States to alien sojourners -- students, tourists, transits, any and all non-permanent aliens -- ineligible for citizenship through birth. Until 1986, children born abroad to U.S. citizen parents could not become U.S. citizens unless at least one of their parent's had lived in the United States for 10 years, 5 years of which had to be after the parent turned 14 years of age. From 14 November 1986, the law changed, such that a child born overseas to a U.S. citizen parent would be regarded as having birthright U.S. citizenship through right-of-blood if the American parent had resided in the United States for 5 years, 2 of which were after the parent's 14th birthday. Note that these residency requirements have applied to naturalized as well as to native U.S. citizens. Their rationale is that, because U.S. citizenship is primarily acquired through right-of-soil, its perpetuation through right-of-blood should be based on a minimum period of stay in the United States. However, children born in right-of-blood states, to American parents who have not satisfied the residency requirement, risk becoming stateless if the state has no right-of-soil provision to prevent statelessness. This was a problem in Japan until 1985, before which time a child born to a Japanese mother married to a foreigner became stateless if its father was an American who had not fulfilled the residency requirement. See, for example, Shapiro v. State.